This is a mainly autobiographical story of one 'Lewis Fergus' , and how mental illness began affecting him from his early years, and principally when he began comprehensive school. He finds the adjustment from 'small school' to 'big school' all a bit too much and retreats into himself, turning from a once quiet but confident young lad and into a virtually mute and cripplingly shy boy. Various incidents occur along the way to re-enforce this way of thinking in Lewis, leaving him a 'wallflower' throughout his school years, rarely mixing and making as few waves in life's ocean as he possibly could. The shy and anxious Lewis Fergus story continues through college, through work, through several bouts of depression and just the simple things of everyday life, and suffering because of how he is, as he feels himself as little more than a observer of life, of others living and getting on and having fun, while he remains on the sidelines - a fun kind and gregarious person trapped in the body of a shy and anxious guy, unable to interact with others in the way he would like to. His fragile confidence and mental state has to contend with the loss of loved ones, anxieties and phobias developing and changing, and the frustrations at his own inability to communicate like he sees others do every day. It was a long winding and punishing road for Lewis to walk and to make the small breakthrough's that would help him to grow and get on as a person. It also includes his genuine thoughts and feelings on events and everyday anxieties and sadness from 2006 onwards, written at the time by Lewis and unaltered beyond spelling and grammar. 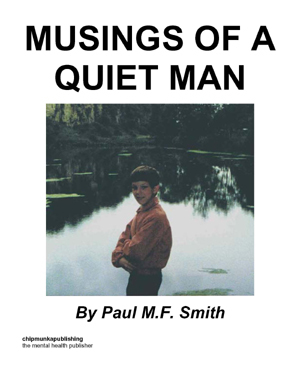 Paul Smith was born and raised in South Yorkshire, now living in south-west Scotland, and he has suffered with cronic depression on and off for the past ten years, along with a mild form of ocd, and a couple of phobias for good measure. These have affected his life in many ways, from socialising and making friends, to struggling to do a job and even using a telephone. It has also affected his sleep to varing degrees and impeded his self esteem for many years. Paul feels this is a genetic affliction, as both his Mother and her Father, along with Paul's sister have suffered with depression. He has also had varied experiences and problems with medication, and three separate occasions of counselling sessions. Well I guess I best start from the beginning, but I don't remember being born, so I'm afraid I can't go back as far as that. Sorry, please excuse the poor attempt at humour there in case you didn't realise that’s what it was – and I wouldn't blame you if didn't. My name is Lewis Fergus, and my story really begins on my first day at secondary school. Before then, I remember being quite a gregarious happy and fun-loving boy. It was only when secondary school began that I showed my true colours as an acutely shy and sensitive youngster – all of which would leave me open to the depression and anxieties that would befall me in later years. First though, come with me as I travel back through the years, back to secondary school. It was a sunny and clear morning. I hadn't slept well the night before – images of getting myself flushed away down the toilet by the ten foot 5th formers had haunted my dreams. It took me awhile to wake up properly as understandably, I was still tired from my lack of sleep. I soon got up when one of our dogs, encouraged by my Mum, jumped onto my bed and walked all over me and dug at the bedclothes, forcing me to reluctantly get up out of bed – though he did apologise by licking my face repeatedly. My Mum asked me in a brazen voice if I was awake now – complete with a cheery cheeky smile, I just threw her a tired funny look and took care of morning business in the bathroom. I could feel my stomach tighten as the thought suddenly popped into my head that I was starting 'the big school' today. I tried to distract myself by touching the mouth ulcer on the side of my cheek, I stamped my feet and cursed inwardly as the pain shot through me, but it was but a momentary distraction. Nothing could make me forget the momentous day that had only just begun. Breakfast was difficult, my stomach telling me that it was both hungry for food but also didn't want anything to eat – all at the same time, my Mum nagging me in that gentle way of hers that was almost not nagging, to get some food inside me, as I would soon be hungry once my nerves had calmed down. I felt that my nerves might never calm down again. I imagined my nerves getting so worked up that I would explode with a loud bang and all that would be left of me would be a messy puddle of yikkiness on the street, pedestrians tutting at the mess as they stepped around my yikky remnants. After a breakfast that seemed to last forever, my Mum and I left the house, the sable collie that had woken me underfoot this morning coming with us. I had tried to tell her that I would be fine getting there on my own – as I didn't want to be labelled as a mummy's boy by my new classmates or the school bullies – even though I was and still am a mummy's boy, I'm proud to say. She wouldn't hear of it; she said the dog needed the exercise anyway after far too many treats – though you try and resist those pleading big brown eyes I dare you. My stomach was still clenched tighter than a boxer's fist and the queasy feeling just wouldn't leave me – eating my soggy sugary Rice Krispies had been quite an ordeal, my head felt light and fuzzy and I clung tightly to Mum's hand, worried that I might faint and fall to the floor with a thud. Mum kept smiling and squeezing my hand tightly, telling me everything would be alright and I would be great. It helped to hear her say this and she was more often right than wrong, so who was I to disagree? She's the greatest authority I know. All too soon, I could see the huge grey brickwork of the building that was my new 'prison' for the next five years. It towered over the buildings around it like a great Roman Colosseum of yester year. Huge ancient trees littered the grounds of the school – ripe for the climbing, not that I would be doing that any time soon. It was all I could manage to keep putting one foot in front of the other, and it used to be so easy as well. All around, other kids of various sizes were making their way to my school too. I occasionally noticed the same pale worried expressions on other kids’ faces that I too was wearing. That didn't help much. Now I knew how the criminals of olden days must have felt as they were lead to the gallows, to their execution. All that was missing was a unruly crowd, baying for blood and vengeance, throwing rotten vegetables at me.